For discussion of all aspects of the New York legends. ... how we got from these quirky, dark, doo-wop influenced folky songs to the Banana Album. Most likely from John Cale starting to get his hands on the music. For sure! My point is, though we have these "Reed/Cale" demos, they are all about Lou. Yes, Cale is there, but still very much in a supporting role. We still don't have that much in-between this and the fully realized masterpieces of the Banana Album. It would be great to have more of a window into the evolution. I think we'll need the Cale Archive for that. But put an electric guitar in Lou Reed's hands and you already have a very velvety sound. The Pickwick song You're Driving Me Insane is a great example. Thanks for the notes to hkmartin. Am I right in thinking that Sarinda reappears on Wrap Your Troubles on the PSAS 65 demos? They couldn't get it in time then either. Questions: So would you say LA Bars is a different song for NY Stars? Different vocal melody? Or just the same song with different lyrics? I'm a bit of an unreliable witness because it took me a day to make the connection, but I believe it was the exact same instrumental track with a completely different vocal track with completely different lyrics. I think different-ish melody, to the extent the song really had a melody in the first place. Whether that constitutes a different song is a judgement call. I don't think the similarity of the names is an accident, though. For the piano tracks, do you think they were Lou or Cale playing? Positively Lou. Cale's only participation was that he was the audience. Lou was playing the songs for Cale, not with him. I posted the LA Bars lyrics on another thread. Yes, I saw that. If I had been thinking, I would have looked at your lyrics and filled in the gaps - sorry. I did write down a couple of things. I saw you have a ? after "clipped". That's definitely what he's saying. Later in the song, the line is: "Hey Joe, give him a 50 cent beer". At least that's what I heard (without looking at your lyrics). Lou's writing is terrible. 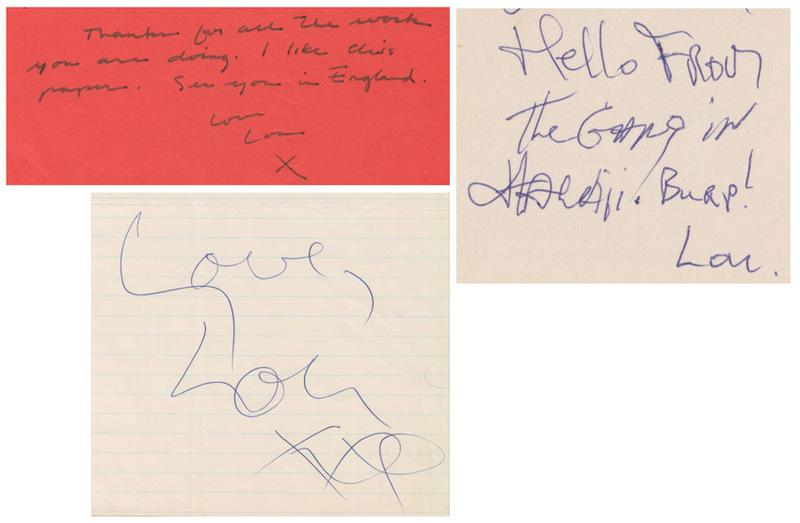 Somewhere I have a separate sheet (not from his 1974 lyrics notebook) of just "New York Stars". Fascinating stuff thanks hkmartin really interesting report. Still digesting all this info.. True true Lou's handwriting was generally bad but given time (and sober?) he had small nice writing - red paper. I gathered 3 examples from the mid 70s which I know are genuine from my collection. Difficult as there are similarities but also differences probably due to 'influences' (!) Maybe as he consumed more his writings became bigger in size..
How can I upload pictures here? Hey lurid, since the demise of Photobucket and their charging i now use an imgur.com account - its free and easy to use. If your image is massive you may need to downsize the resolution first. Drag and drop the image into your account on their webpage, click on the image and then use the BBcode copy option to paste into a post. 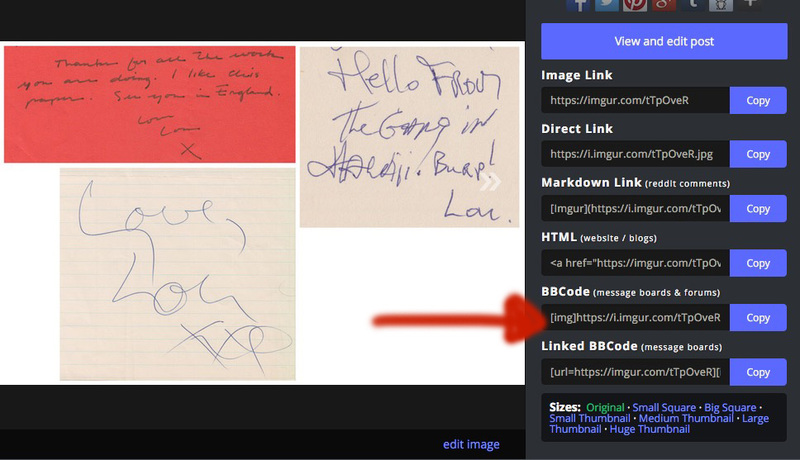 I have to toggle off the 'Disable BBCode' at the bottom of the message options here for it to show up in the post. Check in preview to see whether photo is showing in your forum post. Good luck!